In case you hadn't already noticed, I really like scones. I also have this jar of molasses that has been sitting in my cupboard for the longest time, annoying the hell out of me because I didn't have a clue what to do with it. 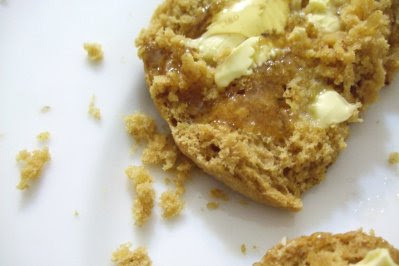 So when I came across this recipe for gingerbread scones, I was practically sprinting towards the kitchen to try it out. 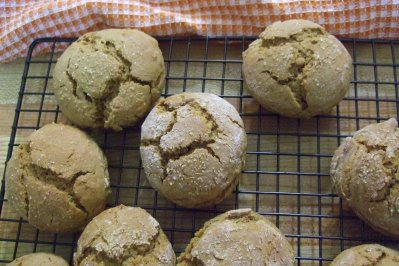 Molasses are very odd smelling and tasting on its own, but made these scones nicely brown and rich. They were fantastic to eat straight out of the oven, crisp and golden like a gingerbread man on the outside but soft and fluffy like a normal scone on the inside. 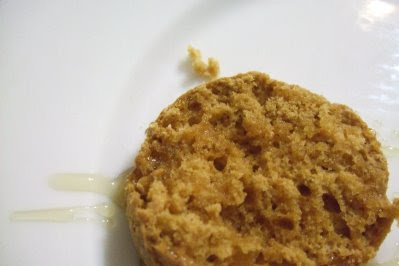 I also added a generous amount of candied ginger which meant that every now and then you would bite into a crunchy sweet ginger piece, lovely! I served them with honey (and butter as well for A), but they were just as good on their own. Preheat oven to 190°C. Line a baking sheet with baking paper. Blend first 6 ingredients in a food processor. Add butter and process until mixture resembles coarse meal. 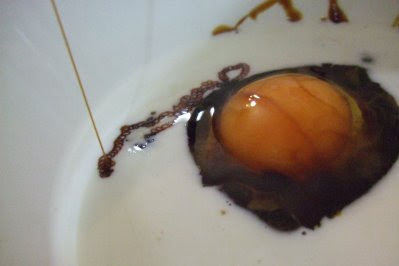 Beat milk, egg, molasses and vanilla in large bowl. Add flour mixture and candied ginger and stir gently until a dough forms. Gather dough into ball. 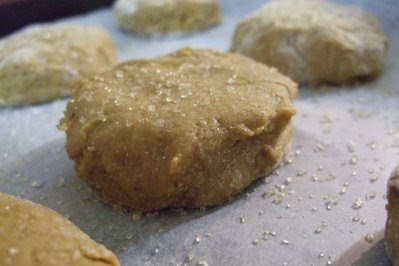 On lightly floured surface, press dough into 1-inch-thick round. If the dough is still quite wet and sticky light dust with flour and knead lightly once with well-floured hands. Cut round into 8 wedges or pat the dough into circles and cut with a scone cutter. Place on prepared baking sheet. Sprinkle with coarse sugar. Bake until toothpick inserted into center comes out clean, about 15-25 minutes. Serve warm or at room temperature. They're addictive aren't they! I made some the other day and now I feel like making some more! 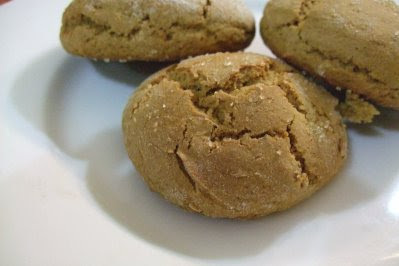 Wow, they sound really buttery, and the colour from the molasses is great! I like your idea of adding crystallised ginger for an extra flavour hit. Oh this looks so good! And I'm a big fan of treacle-y sweet molasses! the pics look great. i can imagine these being super addictive! zomg how awesome! i looove all things gingerbread! Y - Sooo addictive, especially when they are straight out of the oven and smell so good! Arwen - They were buttery in the good way, not greasy but nice and moist. I love candied ginger! Betty - Thank you :) They are! Didn't last very long in my house hehe. chocolatesuze - :D Thanks! Me too! I've made way too many gingery recipes. Lorraine - Aw thanks! They did smell so good, the boy came into the kitchen sniffing around in interest! this is the first time i've seen gingerbread scones and i've bookmarked the recipe for cooking on the weekend! this might be a stupid question but can you get molasses at the supermarket? Excellent! :) I'd love to know how they turn out! Usually you can, we found them in the health food aisle in Coles, around where all the gluten free stuff was. 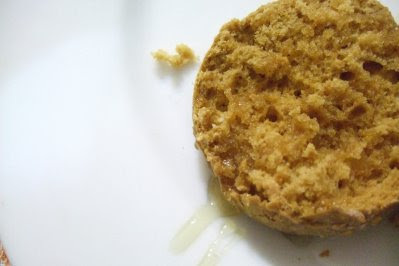 If you can't find it you could probably substitute it with golden syrup and reduce the amount of brown sugar in the recipe.